Aerofarms’ stackable vertical farm uses mist to grow crops in areas where land is non-arable, like in the United Arab Emirates. Vertical farming, where crops are raised in skyscrapers or on stacked layers may be the best way to feed water poor countries with non-arable land – like many of those in the Middle East. Today we talk with vertical farm innovator Dr. Edward D. Harwood the founder, CEO and director of AeroFarms. Founded in 2004, and based in the US, his GreatVeggies product, is based on Harwood’s own design of an aeroponic growing system (growing food without soil). 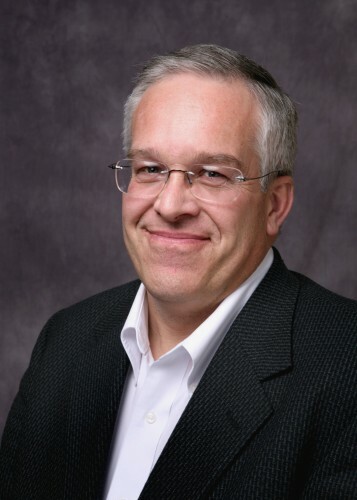 Harwood has 20 years experience in corporate product management in the dairy industry, several years in sales and service of weather graphics systems and a number of consulting projects involving food market channel mapping. Today he tells us about the benefits of the AeroFarms’ solution. Vertical farming could be the future of Middle East farming. Why? What are the opportunities? In any countries in particular? In general the aeroponic method is water conserving and reuses the nutrients almost fully when the system is configured as a closed-loop. This would then require far less water and imported nutrients. Most important, aeroponics enables the growing of produce without soil, which is critical to the Middle East region where arable land is extremely limited if not nonexistent. The AeroFarms system enjoys other features to benefit the Middle East. The use of artificial lighting allows growing indoors where cooling can be centralized and the radiant heat of the sun avoided. Further, locating anywhere means the facilities may be buried beneath the earth to further insulate the growing space for the heat. Growing leafy greens, including herbs. will result in greater local food security and reduce the need to acquire foreign lands to ensure supplies. Tell us a bit about your solution and what need it answers. AeroFarms has developed an advanced, proven aeroponic system that grows produce without soil or sun, all year round and in any location. The systems are vertically stackable and are well-suited for old or vacant warehouse-type buildings, abundant in urban areas. The systems have 24/7 controlled lighting, temperature, and humidity, accelerating the growth cycle from 35-70 days to 18-21 days. While aeroponic technology is at the core of the system, proprietary developments in growing medium, lighting and the mechanical design are all integral in making the AeroFarms system superior. Aeroponics is a cutting-edge type of hydroponic technology that grows plants in a mist. The aeroponic mist most efficiently provides roots with the nutrients, hydration and oxygen needed. AeroFarms has designed its system to eliminate nozzle clogging and reduce water consumption through nutrient re-circulation. AeroFarms’ has developed a proprietary, reusable cloth medium. AeroFarms systems employ the cloth as a conveyor belt that moves plants from one end of the system where they are seeded to the other end where they are harvested. The cloth has a number of benefits such as durability and reusability, increased cleanliness and sanitation, and the efficient harvest of a dry and clean product. Vertical farming with LED white lights. AeroFarms is pioneering the use of LED (light emitting diode) lighting for commercial growing systems. There is enormous potential for the use of LEDs across cost reduction and yield improvement. LEDs have nearly 10 times the life expectancy of HPS lighting, resulting in a much lower total cost of ownership. LEDs can also be designed in linear and rectangular shapes that enable complete yield uniformity, compared to an HPS bulb that unevenly distributes light to the crop. Another advantage of LEDs is the ability to target specific wavelengths of light, allowing for reduced energy consumption and nutritional enhancement. Lastly, LEDs can be placed much closer to the plants than HPS lights, enabling greater vertical stack-ability of modules. Growing in a standard building structure changes both pest pressure and the pest environment. Plants are grown in a machine inside the building and not out in the open where they attract pests. Our cloth growing medium is sanitized between every growing cycle of 18-21 days. Most pest cycles of more than 21 days are broken. Many other aspects of the equipment design include ways to minimize pest exposure and reproduction. With AeroFarms pest-resistant design, pesticides are unnecessary. No special seeds are required, so pesticide-free and organic seeds can be used. The size and configuration of an AeroFarms system are highly customizable. The systems are comprised of modules, which serve as the building blocks of a system that can be stacked vertically or attached lengthwise. This modular approach allows for flexibility of location, higher yield per square foot, and faster installation times. How the AeroFarms’ solution stacks up. In order to be sustainable in the future, agriculture needs to produce food locally, with less water, and more safety. The AeroFarms™ system easily accomplishes this because the leafy greens are grown without soil or exposure to manures, and because the handling process is able to be controlled carefully and easily monitored to ensure safe food. Is your solution commercial, scalable, and how does it compete with others out there? Our system is commercial. The idea is to fill any size vacant indoor space with growing equipment. Our competition does not address growing leafy greens well. NFT systems do tomatoes very well and deep water systems produce heads well. A new system called Omega Gardens grows indoors and stacks the growing but has not moved to LED lighting. What’s the difference between aeroponics and hydroponics? 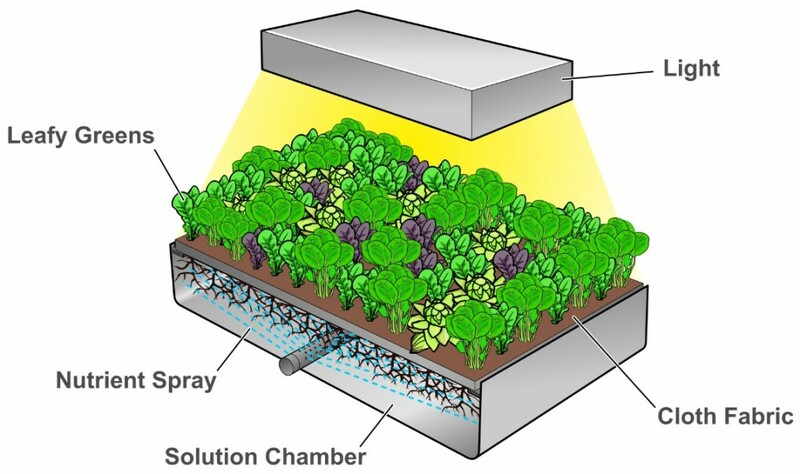 Aeroponics is a form of hydroponics – hydroponics means working with water. Aeroponic systems spray nutrients on roots suspended in the air, deep water hydroponics floats the plants with roots dangling in a pond of water, and NFT (Nutrient Film Technique) periodically flood s the roots with nutrients. What kind of investment/technology would be needed to provide enough veggies for a town of 30,000 people? 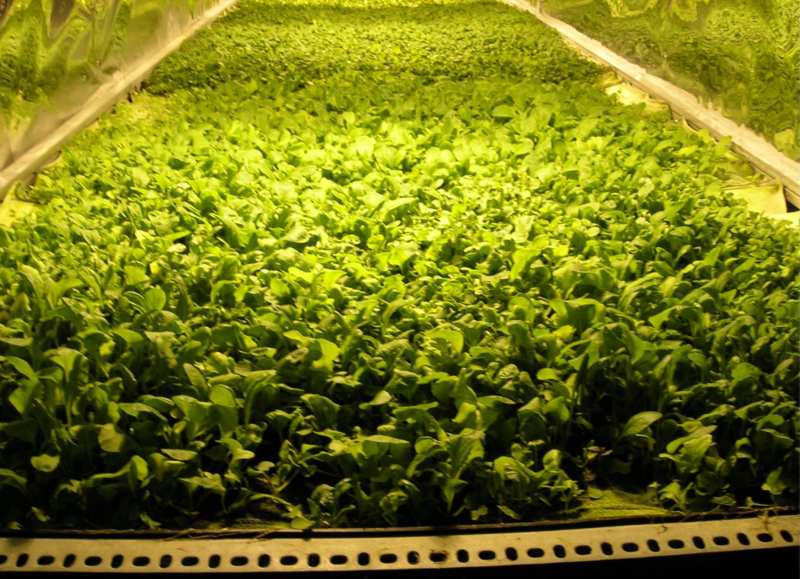 Approximately $8 million of investment in our technology would provide 30,000 people with enough salad greens. (Assumes average person eats 2oz salads twice a week). 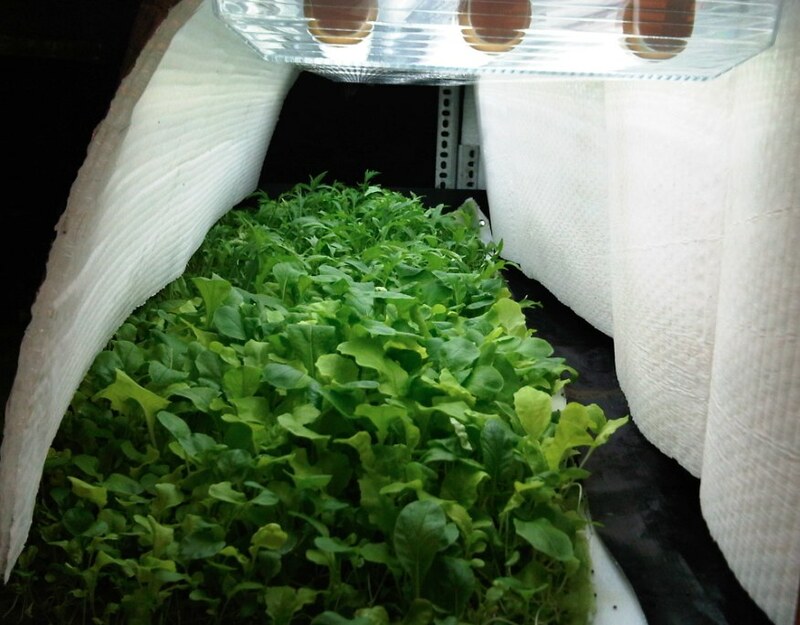 Growing arugula on the AeroFarms’ vertical farm. If you could work in any Middle East city, where would it be and what would you propose? Masdar city would be a very exciting city to enter the Middle East in given the attention it is receiving around the world as a showcase for clean and efficient technologies of the future. The United Arab Emirates is one of the larger arabic markets and also has access to the capital required to make the upfront investment in our technologies. Aero Farm Systems, LLC (“AeroFarms”) provides aeroponic growing systems that grow produce without soil and without sun, all year round and in any location. 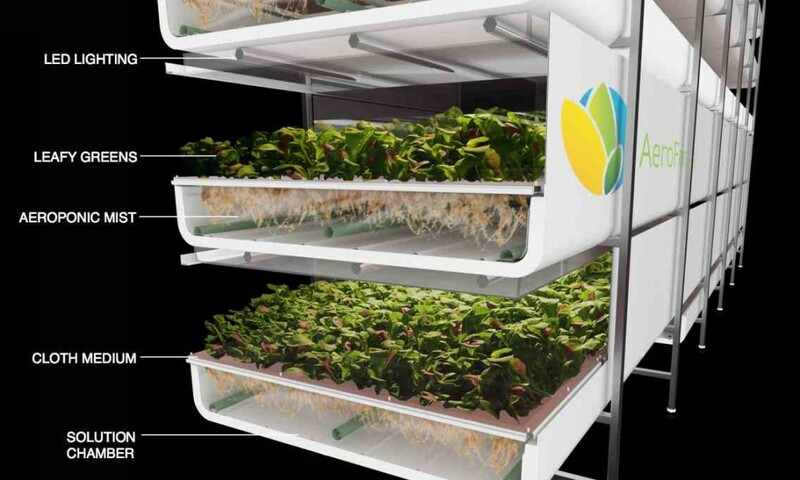 AeroFarms modular, vertically stackable systems are designed for locating in old or vacant urban buildings, enabling local production of pesticide-free, fresh, clean greens. AeroFarms systems transform food production into a more sustainable, efficient, and safe process by enabling profitable, commercial-scale vertical farming in urban centers. Founded in 2004, AeroFarms is based in Ithaca, NY. More information can be found at www.aerofarms.com. Will Farmers of the Future Work in Skyscrapers? what do you use as soil? and what is nutrient spray? do you think in future if we confront a new health problem ? want to start a small babay sprout farm in Tzfat Isreal please give location of supply house ? I find this artcile on VF very interesting and informative. I have been following hydroponic cultivation for the last more than a decade and have also grown tomatoes hydroponically in simple systems. Now I also want to associate myself with VF. How can I contribute? Can you suggest. I noticed that you have been following the hydroponic cultivation for a long time, as an individual, not a business. Well I just started to follow this and would like to try it in my new project in China. I cannot afford AeroFarm system at this moment so maybe you do not mind spending some minutes helping me? I am going to build a small hotel of about 50 rooms in the country side, which land is owned by my mother, and I would like to supply vegetables and maybe live stocks too, by ourselves. The planning just started. Anyone who is willing to help me would be much appreciated. The idea makes sense and has lot of potential for cultivation on nonarable land also. It would be possible to grow any crop anywhere irrespective of agroclimatic conditions without botheration of season. In one chamber you can create conditions of one region to grow crops of that area and in another for second area crops. Most of China’s land is non arable land with the Gobi desert growing at an alarming rate. The accepted predictions of China’s population move into urban areas is 200 million people over the next 15 years. How will these people eat. Companies like this one are currently trying to solve that very imminent and real problem. We are writing about this because vertical farming could be a viable solution for the Middle East. One could say that living in Canada or the Northern US states are incapable of supporting life too. Good thing there’s been a few decades of an endless supply of fossil fuels to keep people cozy and factories running – to support life. Get real! Gee, let’s see. Let’s take a desert incapable of supporting life, now pack it full of laborers who come from fertile lands, and have to spend billions on fancy “science” to keep them alive!! When will this nonsense end? And why are you writing about it? ?